Kappil beach is about 7 kms north of Varkala. It is a beach – backwater destination. Kappil is not just another tourist spot. It is a must visit place, especially if you are spending time at Varkala beach. The answer is better said in pictures than words. In the above photo, it may appear that the road is splitting the water in two. In reality, they are waters of different natures. The west is the true blue Arabian Sea and the east is Edava Narayana Lake, which takes on a greenish tinge at times. The road runs as such for about one km. One of the best places for a bird’s view is the bridge across the lake. Not too far, the backwater drains into the sea. Splendid! 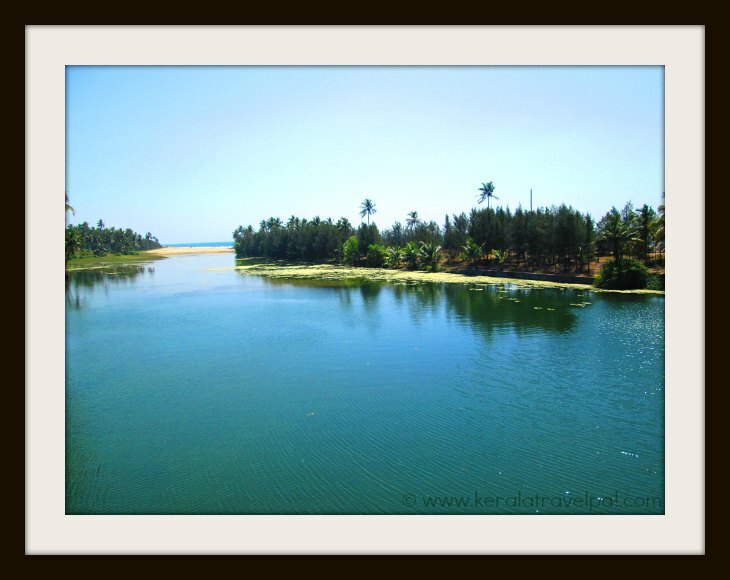 The lagoon- coconut- sand strip of Kappil is a stunner. What if I say these are some of the most photographed coconut trees in Kerala? Either true or it is a shot close to truth any way. You can even walk from Varkala beach to Kappil. There is a beach side walkway from Varkala, to start with. It is built by the government, with tourism in mind. However, you will have to find your own path after a while. 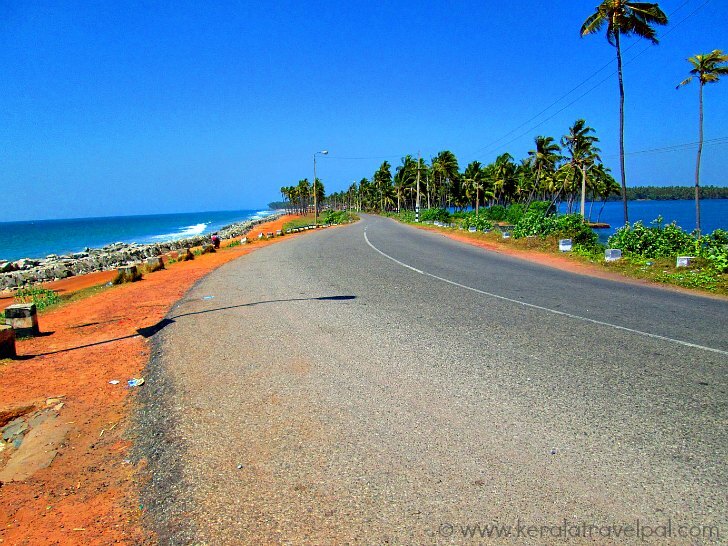 If you proceed through the beach side, Edava sands comes first followed by Kappil beach. The beaches at Vettakada, Edava and Kappil are gorgeous in appearance while being limited in scope. So they remain as local beaches where you could sit by the sea side and relax. These beaches feature a rocky barrier, a harsh reminder of the powerful tides of the swollen sea. And these rocks stand up to the onslaught of waves quite regularly, protecting the beach side road and nearby settlements. By the way, Kappil beach has its fishing community. The true fun of Kappil is the backwater ride. There are not many boats. And there are not many people too. There is also the choice to take mini boats for a ride. Row and pedal boats are available for hire at the boat club. The local shrine, Kappil Bhagavathy temple, is a regionally famous temple. The shrine is attractive, but this is a place of worship and not a sightseeing location. Darshan (worship) inside is limited to Hindus. The best place to stay is Varkala itself. There is a wide choice of accommodation in Varkala, servicing diverse holiday budgets. Kappil is about 7 kms from Varkala beach. From Varkala, the best way to reach here is to hire an auto rickshaw. You can also hop on to one of the buses that service to Kappil. Kappil near Varkala should not be confused with Kappil beach at Kasaragod. 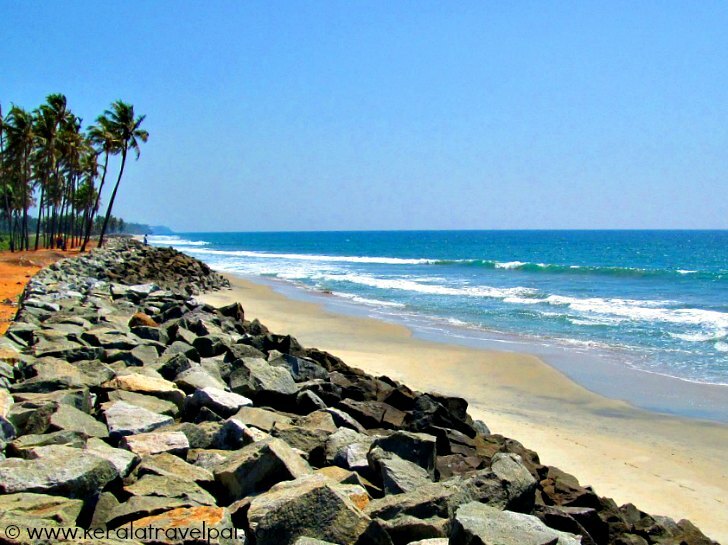 Of course, the major regional attraction is Varkala beach. If you are looking for a beach, all left to yourself, try Edathua and Vettekkada. Sivagiri mutt and Janardhanaswamy temple, being attractions in Varkala, you may have already planned to get to. Nellatil, Paravur and Nadayara are scenic areas if you want to tour the wider zone. The Golden Island (Ponnumturuthu), Anjengo Fort and Varkala Tunnel are the other usual inclusions in local travel plans. Nearest towns: Kollam at 25 Kms, Trivandrum at 57 Kms and Varkala town at 7 Kms. Railway Station: Varkala Railway Station at 7 Kms. Well connected to other towns/cities. About 20 trains stopping here per day make travel to Varkala easier. Air port: Trivandrum Int’l Airport (TRV) at 57 Kms. Food Options: Varkala town as well as beach cliff top. Accommodation Options: Budget to luxury hotels, lodges, Resorts and homestays at Varkala beach and town. Nearby Attractions : Sivagiri Temple/ Mutt, Janardhana Swamy Temple, Anjengo Fort, Varkala Tunnel, Ponnumthuruth Island, Varkala beach, Neyyar Dam, Agastyakoodam, Ponmudi Hill station, Ananda Valleeswaram Temple, Thirumullavaram beach, Thangasseri beach, Ashramam Picnic Village, Mahatma Gandhi beach and Kollam town (Shopping & food).